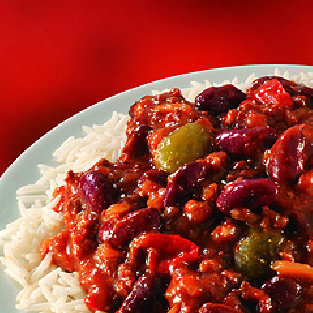 Everybody loves chilli non carne - the meatless version. I printed this recipe from the BBC website, where I often go when I have a particular ingredient in mind and need inspiration of what to do with it. 1. Heat the oil in a large frying pan, toss in the onion and fry for 3-4 minutes. 2. Stir in the garlic, chilli powder, green chillies, vegetarian mince and mushrooms and fry until browned. 3. Pour in the red wine and, when this has evaporated, add the stock and the tomatoes. Cover and simmer for 20 minutes. 4. Add the kidney beans and simmer for a further 15 minutes. 6. Serve with rice and a spoon of tomato salsa and warmed naan bread.